Buddhist nun Venerable Yin Kit (Sister Jessie) has agreed to be part of UFV’s Human Library. Have you ever wondered what your title would be if you were a book? The University of the Fraser Valley Chilliwack campus library wants to know. As part of its outreach program, it is looking for “human books” for a display and event. You can nominate yourself or someone else. Those chosen as human books will be featured in a prominent display in the UFV Chilliwack library, on a poster, and on the library web page. The library will also host an event in February, at which members of our human library will be invited to speak and to participate in round-table discussions about their experiences. If you’re intrigued about the idea of sharing your experience and being a human book, apply via this form and return it to the Chilliwack campus library. Due to capacity limitations, UFV will only be collecting one or a few books on each topic, and as a result, some nominations may be held for future collection. Two people who have agreed to be part of the Human Library project so far are Venerable Yin Kit (Sister Jessie), a Buddhist nun who teaches meditation to federal inmates, and Darren Blakeborough, a UFV assistant professor from the Social, Cultural, and Media Studies department. 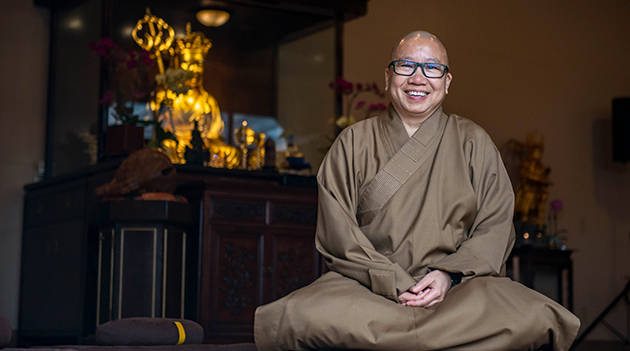 Sister Jessie, as she’s commonly known, says she bridges Buddhist tradition and modern communications methods to bring her teachings to the people of the Fraser Valley. “Outwardly, I appear out of time and out of place. As a fully ordained Buddhist nun, I wear long brown robes, and shave my head. I follow teachings that have been passed down from monastic to monastic for over 2500 years, from the original teacher, the Buddha. I have taken a vow of poverty and follow 348 precepts (rules for monastic living). These life choices link me firmly to the past and to time honored traditions most people in the West are unfamiliar with. “However, I also use an i-phone, use a laptop to check my Facebook account on a daily basis, travel the world continuously to teach and serve, and all my students know how much I enjoy a Dilly Bar on a hot day”. Blakeborough looks more like a biker than a professor (he is both) and is known for bringing the study of popular subcultures into the academic realm. United Way campaign oh-so-close to goal. Help us raise $25,000!